This week is another occasion of foot-in-mouth disease for me on NagiAsu. After a few episodes where I’ve been thinking Hikari is acting a little better, this was one where he almost completely regressed into the character that I don’t care for. He’s become completely obsessive about Manaka and Uroko, wanting to blow off school, homework, everything to spend all his time diving to Shioshishio to try to find Uroko. I guess he can’t get it through his skull that if Uroko doesn’t want to be found, he’s not going to be found. That’s one of the privileges of being a deity. I know that some people might think Hikari’s behavior is admirable, but I’m certainly not one of them. And in the process of ignoring pretty much the rest of the world, except where they give him the merest of straws to grab onto for waking Manaka up, he continues to hurt Miuna’s feelings by ignoring her. So it’s no surprise that, feeling slighted, she starts to wonder if she really wants Manaka to wake up. Miuna’s big mistake, tho, is saying out loud that Manaka might not wake up, and that Hikari shouldn’t ignore the rest of his life. She’s right, but he doesn’t want to hear that. And he even makes himself sick in the effort to prove her wrong. That gives Miuna the chance to take care of him for the day by faking being sick also, and giving Akari a chance to lecture Hikari about other people helping him. But Miuna’s still not sure what she’s feeling. I was really surprised at Tsumugu, who picks up on her sadness and meets with her to talk about it. That’s the most outreachy that he’s been. And he gives Miuna good advice about not feeling like part of the group, and relates his own hesitation about the others waking up, since they might take Chisaki away from him. 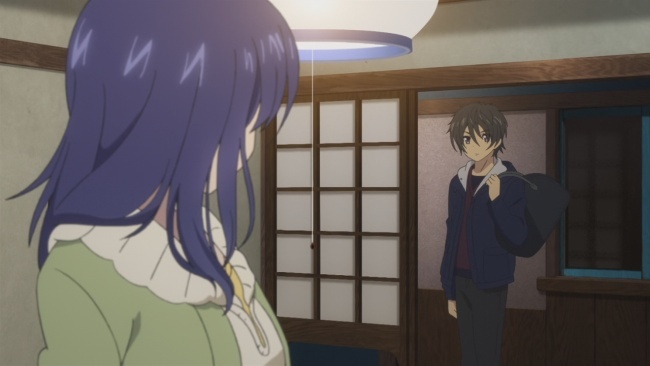 But he found that he was still really happy about them waking up, and he’s sure that Miuna will feel the same. Not a lot of movement in the other relationships this week, as most of the time was spent on Hikari and Miuna, revolving around Manaka. 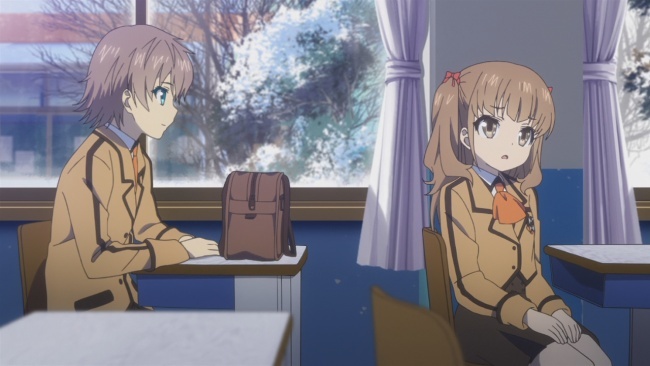 But I think we did see something with Sayu and Kaname, as Sayu apparently regained her ability to interact normally with Kaname, which was the first thing she needed to do. We also saw Tsumugu say that, in being afraid that Chisaki would be taken away from him, that he wants to have a life with her, probably one a lot like they already have, but acknowledging each other as someone they love. Perhaps now he’ll have the ability to speak up, since Manaka finally awakens at the end of the episode. Well, I’m a big goose-egg on predictions for this show so far. “No, Tsumugu will be in love with Manaka.” “Manaka won’t wake up.” I’m starting to wonder what else I’m completely wrong about… don’t answer that. Anyway, Manaka’s awake, and she’s going to be playing a major part, it looks like, for the rest of the series. Only a few episodes left, and everything’s pretty up in the air. We don’t even really have a side couple that’s in a stable relationship, unless you count Itaru and Akari, but they’re definitely an OTP. In an effort to quit eating toenails, I’ll refrain from any predictions about what’s going to happen with the relationships of the rest of the crew, at least for this week. And poor Miuna will never have a chance. That may be true, but I don’t think that Hikari would go for anyone if not for Manaka, so Miuna would probably still not have a chance. I’ll also say that ‘waking up to scold Hikari’ is, I think, more of a coincidence than anything else. I don’t see why her waking up right at that time has to be anything more than a coincidence. If Hikari had kissed her, then that would have been something that could be a trigger. But Miuna and Hikari arguing there, when Akira and Hikari had roughhoused, and everyone else had talked around her, doesn’t really lead to causation for me. Okada has been following the blog. Her and P.A. Works. They give you great scenery, but then they pitch a perfect screwball at you. I’ll take that hit to my personal pride to get great scenery. Nobody does it better and as consistently. KyoAni makes wonderfully representative looks, but they’re a lot like looking at real life. PA Works makes even shabby scenery look tremendous. This show is a perfect example. Everything we see in this show is beat up, peeling paint, rusting out, falling down. And yet it’s still a treat to look at. And from an architecture standpoint, it’s so rewarding. All those curved buildings, curved glass!!! !, round forms, fish and waves and sky painted on everything, even indoors. Really a lovely world. I think he has the tendency to see himself in other peoples feelings, and he talks just as much about himself as he does the other person. Dude needs to lay it all out; much like Golden Time, coming out and saying it speaks volumes. Tsumugu does do a good job talking about feelings without descending into mansplaining. Well, at least this time Hikari wanted to blow off school a bit because of something worthy of some kind of merit, as in trying to help Manaka. At first, he wanted to do due to hostility with the surface people. I think most can understand why he’s doing what he’s doing. The thing with people is when someone/something close to them are unable to carry on like they used to, they get anxious to see things return to normal. So it’s kind of expected Hikari would shut everything else out and focus on Manaka, even if means others get unintentionally hurt like Miuna. Plus she’s still struggling with her feelings toward him and could be jealous. How convenient. Of all the things used in the attempt to wake Manaka up, it was a Hikari temper tantrum that gets the job done. I guess this means those two are really meant for each other. Hikari does what he wants. At this point he’s looking for the god under his own nose. That wonderful bit in the OP of him holding the flag, reaching up and penetrating the surface of the sea.